I was never a big fan of the Pretenders but it’s hard to say that now that I’ve listened to Shilpa Ray and Her Happy Hookers. Yes, I get the Misfits feel for this band but it’s not as crystal clear as one would expect. 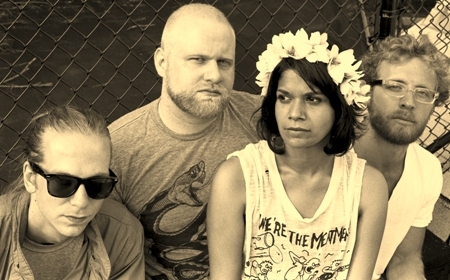 Shilpa Ray keeps the band at bay with her shrill and beautiful voice, with Andrew Bailey, John Adamski, and Nick Hundley bending to her will. Oh they will be at SXSW and oh, they will rock out hard. Do me a kindness and crank up ‘Venus Shaver.’ The comparison to Chrissie Hynde is way to obvious. What I like is that they pull the epic move much like the Yeah Yeah Yeahs in middle of this jam. I mean at the peak of the chorus you can feel the ethereal tear at your bones when Ms. Ray rips into it with her voice. I’m still trembling. Still trembling.